Editor’s Note: This post was co-authored by Cara Baldari of First Focus and John Sciamanna of The Child Welfare League of America. The only federal cash assistance program available for low-income families turns 20 this month. The Temporary Assistance for Needy Families (TANF) program helps families provide basic necessities for their children and supports them on their path to financial security. Studies show that when families receive a boost in income, it promotes healthy child development and improved well-being for both children and parents. Children make up over 70 percent of TANF recipients. TANF funds reach children in different ways. TANF funds provide cash assistance to families with children and support programs that benefit children and their families, such as child care assistance and child welfare. Any discussion around TANF reform must keep children front and center. TANF has been scheduled for reauthorization since 2010 and there’s major concern that TANF’s buying power does not support low-income families and helps lift children out of poverty. Since the 1996 welfare law, the share of children below half of the poverty line rose from 2.1 to 3 percent (1995 to 2005), and the number of children in deep poverty increased from 1.5 to 2.2 million. 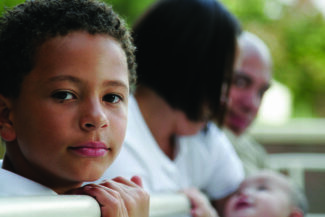 By making child poverty reduction an explicit goal of TANF, it would help ensure that states use TANF funding in ways that have a direct effect in reducing child poverty – and that a state’s use of TANF funds is evaluated based on the number of children and families below the poverty line that are lifted out of poverty. 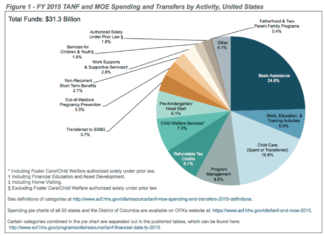 New data on state funding for TANF was released this week. The first five years after TANF was enacted, with decreasing necessity in a booming economy, there was a push to include child poverty reduction as an explicit goal in the bill’s reauthorization as a way to better help the remaining TANF-qualifying families. Congress failed to act, but today there is bipartisan agreement on child poverty reduction. The Obama Administration’s FY17 budget, the 2015 House Ways and Means Committee discussion draft, and the recent bipartisan EMPOWER Act (S. 3091), led by U.S. Sen. Angus King (I-ME), all include adding child poverty reduction as an explicit purpose of TANF. TANF can lift children out of poverty by helping parents secure and maintain quality jobs that allow them to sufficiently provide for their family. TANF can promote economic mobility for families by allowing them to utilize TANF funds to pursue basic education, skills training, or vocational education that leads to quality employment. This includes providing child care assistance while parents are pursuing education. An evaluation of Maine’s Parents as Scholars program, created during the first years of TANF, found that parents enrolled were more likely to find jobs that provided economic mobility. For TANF child-only cases, where the eligibility for TANF funds is based solely on the children, states need to evaluate the effectiveness of these grants in reducing poverty and improving well-being among child recipients. The make-up of the households receiving child-only grants vary from state-to-state and increased data is needed to understand their characteristics. These child-only grants need to be accompanied by assessments to determine how the children in the household are faring and if they need increased support, as well as whether a child would be better served through other systems and resources. Some states use a large percentage of their TANF dollars to fund their state child welfare systems. While it is important for states to fund services that provide critical support to children experiencing abuse and neglect, we must ensure states are using TANF funds strategically. Rather than just plugging budget holes, states should use TANF funds for evidence-based prevention, intervention, and kinship services and ensure families are not pushed into the child welfare system because they were not able to access cash assistance to provide basic necessities for their children. TANF funds used for child welfare services, including kinship care should be a complimentary and a coordinated service that assists families that enter either program. Due to TANF’s design as a fixed block grant, the program doesn’t respond to times of increased need. In 1996, TANF could provide assistance to 68 percent of families in poverty; however, by 2010 that number dropped to just 27 percent, and caseloads have continued to drop despite the fact that need has not decreased. The Obama Administration’s FY17 budget proposes a new Economic Recovery Fund that improves TANF’s ability to respond to increased need during a financial crisis. This is modeled after the successful TANF Emergency Fund that was authorized in 2009 after the recession hit, but has since expired. All of these recommendations cannot happen without increased resources to TANF. The overall block grant has fallen in value by 32 percent due to inflation since 1996. The Obama Administration proposes an $8 billion increase over five years, which would provide critical resources for these improvements and allow TANF to serve more families in need. A failure to increase funding and address twenty years of inflation will weaken not just TANF-assisted families with children, but will undercut child care and child welfare services across the nation. In order to ensure TANF improves child well-being and helps lift children and families out of poverty, we must take a holistic approach to reform and meaningfully discuss how the program is serving, and failing to serve children across the nation. This week the Administration for Children and Families released new 2015 Financial Data that provides a more detailed breakdown of state TANF spending. Read the report to better understand how to reform TANF for kids in poverty.